PRC stands for Polynomial Regression Channel. This is a regression indicator that is used on charts. A linear regression indicator draws a straight line of best fit on a chart. The PRC indicator applies a polynomial function to the linear regression function to adapt itself to the flow of market prices. 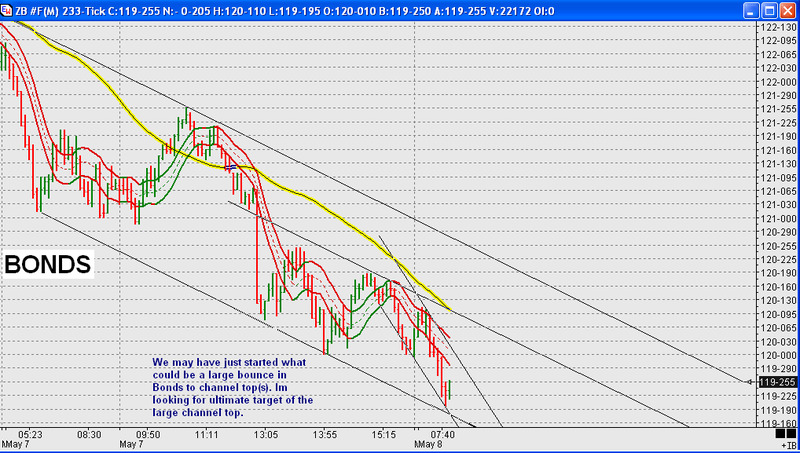 Since they are regression bands that self adjust for volatility. Do you have a question about how to use this indicator? If so, we have a topic in the forum dedicated to this indicator: Polynomial Regression Channel Discussion. This indicator is used to fade the direction of the market. The basic trading strategy is to buy when the price enters the lower band region or sell when the price hits the upper band. Traders will take profits at the middle band but an aggressive trader might hold out and expect the market to hit the other band. If you are an eSignal user and want us to create this indicator for you for eSignal then contact us and let us know.